Looking for a New Ford EcoSport in your area? 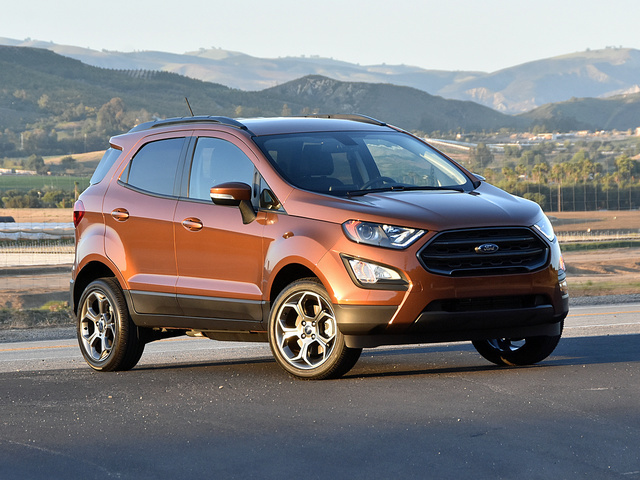 CarGurus has 3,269 nationwide Ford EcoSport dealers with 133,091 new car listings. Small SUVs are appealing, especially when they appear to offer lots of equipment and capability for relatively little money. Among them, the 2018 Ford EcoSport fails to make a compelling case for consideration. Americans have an insatiable thirst for SUVs. From the smallest and most affordable to the largest and most expensive segments, the SUV is transforming traditional ideas of what a car is and what a car does. Ford, however, which kicked off the SUV craze with its original Explorer way back in 1991, has had nothing to offer budget-conscious SUV buyers. Until now. Meet the 2018 Ford EcoSport (pronounced echo-sport). 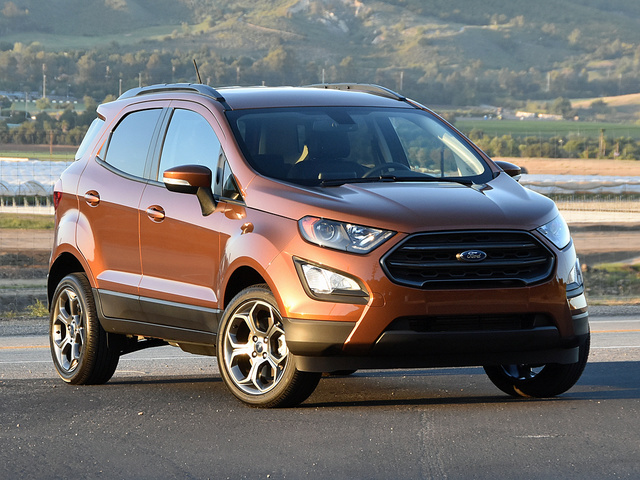 Available all around the world for years, the EcoSport is new to American car buyers. It is a stop-gap measure to plug an increasingly large hole in Ford’s SUV lineup, a Band-Aid fix designed to tide brand loyalists over until a more modern replacement arrives. How so? The last time the EcoSport was redesigned for global markets was for the 2013 model year. That makes it old, even though it is new to the US. Also, the one we get is sourced from the automaker’s Chennai, India, assembly plant, which suggests that product planners scrambled to rush the EcoSport into your local Ford dealer’s showroom. In any case, the EcoSport is, umm, an interesting specimen to behold. 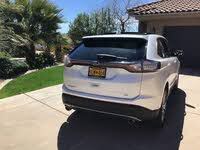 Viewed straight on in the front, it looks like the larger Ford Escape and Ford Edge. Viewed straight on in the back, it has simple, tidy, tasteful proportions. Otherwise, this thing resembles a Ford Fiesta viewed through a fun-house mirror. The EcoSport’s height and huge fender flares make the wheels look tiny, and the combination of excess visual weight over the front axle and rear wheels pushed out to the corners produces a cartoonish stance. My test vehicle wears SES trim, which includes dark gray grille detailing and exclusive 17-inch aluminum wheels in a captivating Dark Tarnish finish. 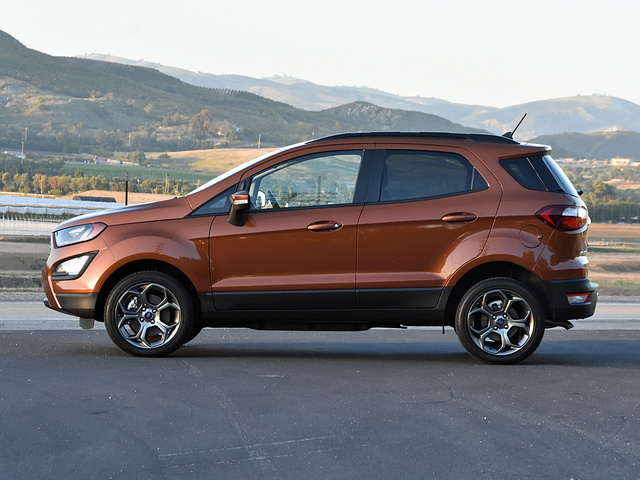 At $26,880, plus a destination charge of $995, the EcoSport SES carries the highest base price of the lineup, but that’s because it has standard all-wheel drive (AWD). The least expensive version of the SUV is the S trim, at $19,995. Most people are likely to choose the SE ($23,000) for its blend of value and equipment. The SES is supposed to be the sporty version of the EcoSport, while the Titanium adds a dose of luxury. No matter which version you choose, the interior is mix of cheap plastic and, at least in SES trim, unexpectedly impressive bits and pieces. The upper dashboard is covered in soft material. The storage slots have a rubbery coating to quiet noise and prevent items from sliding while stored. The switchgear is yanked from the same parts bin that serves various Ford, and even Lincoln, models. The freestanding, tablet-size Sync 3 infotainment system is a model of modern design and user experience. Furthermore, the SES trim demonstrates a flair for design. Check out the copper interior trim pieces that matched my test vehicle’s Canyon Ridge paint. And those retro stripes on the seats scream 1970s… in a cool way. 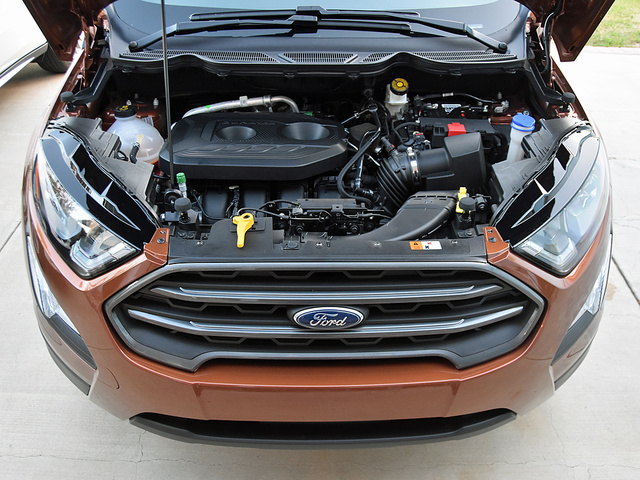 The most disappointing thing about the Ford EcoSport SES is its engine. This is the only version of the SUV equipped with a standard 2.0-liter 4-cylinder and AWD, presumably because it is supposed to be the sporty model. Other EcoSports have a standard 1.0-liter 3-cylinder turbocharged engine that makes 123 horsepower at 6,000 rpm and 125 lb-ft of torque at 3,500 rpm. Folks, that ain’t much in a vehicle that weighs over 3,000 pounds in standard specification. The turbocharger helps, of course, but c’mon. Put some people and cargo into this thing, and it’s going nowhere fast. If you want AWD, you must get the larger 2.0-liter 4-cylinder engine. And if you want the larger 2.0-liter 4-cylinder engine, you must get AWD. They go hand in hand. This engine generates 166 horsepower at 6,500 rpm and 149 lb-ft of torque at 4,500 rpm. That’s 43 more ponies at 500 higher rpm, but just 24 added lb-ft of twist that you’ll wait for an extra 1,000 rpm to access. Plus, this powertrain combination adds an extra 279 pounds of weight to the EcoSport, virtually erasing any possible performance improvement. At least the 6-speed automatic transmission is pretty smart about executing gear changes. Left in Normal mode, its job is to balance responsiveness with efficiency. Placed in Sport mode, it definitely makes the EcoSport feel livelier, and the SES trim’s paddle shifters (!) are actually effective, but that sounds more impressive than it is. There’s no getting around it. The EcoSport is slow. It gives its driver little confidence when accelerating onto fast-flowing freeways, or when attempting to take advantage of holes in traffic, or when trying to get onto a busy boulevard from a side street, or when turning left against oncoming traffic, or when driving up a mountain grade. No joke, a guy in a Ford Transit cargo van raced me away from a light to get to a freeway on-ramp. The van was loaded down with stuff. It almost won. Simply put, there is no way I could live with this utter lack of motive force. And it sure doesn’t help that it feels like the EcoSport is standing on its tippy toes all the time. Or that the electric steering feels murky on center, and when you’re on the freeway, this causes a continuous sensation of instability. Around town, the engine, the transmission, and the steering are fairly agreeable. But the brake-pedal calibration is terrible. It’s like an On/Off light switch. And that creates a constant source of irritation. Plus, forward visibility to the corners is horrible. Immediately after picking up this EcoSport at the airport, I was rounding a curve in a road. A car carrier was parked in my lane, unloading vehicles, and I needed to cross the double-yellow line to get around it. But I literally could not see if it was safe. I had to lean over and look around the enormous windshield pillars. Surprisingly, where the EcoSport’s mechanical hardware seems to come together best is on a canyon road. Going downhill, of course, because of the weak engine and how the transmission tends to hunt when climbing a mountain grade. 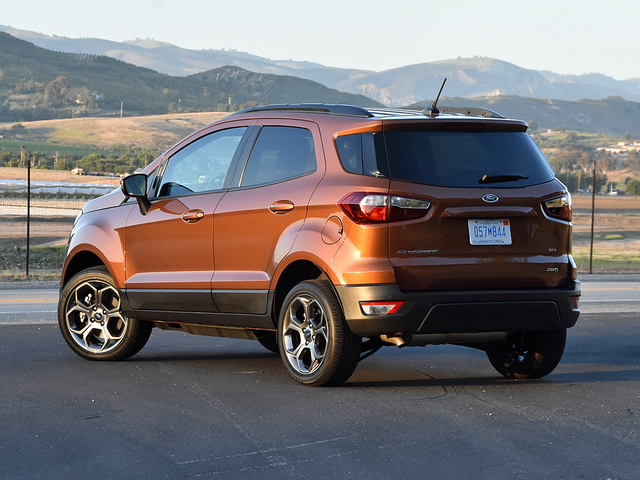 The EcoSport SES includes a sport-tuned suspension, and it produces a stiff ride. At the same time, should you elect to fling this version of the EcoSport down a favorite back road, it actually handles pretty well, the SUV’s small footprint allowing a driver to preserve speed through maximum use of available lane real estate. The steering’s on-center uncertainty isn’t an issue when threading curves, and while the 4-wheel disc brakes remain hard to modulate, at least they do a decent job of resisting fade from repeated use. If you’re wondering, yes, I took the EcoSport on a dirt trail. It tackled terrain a car could not, but it wasn’t nearly as capable as some of its rivals in the subcompact SUV segment. Fuel economy is nothing to brag about, either, in spite of the standard automatic engine stop/start system. On my test loop, I averaged 22.8 mpg, far less than the EPA’s estimate of 25 mpg in combined driving. That’s a terrible result and no doubt reflective of an underpowered engine working overtime. With the EcoSport, you get the benefits that people seek when they buy this type of vehicle. You sit up high, able to see over shorter cars. Entry and exit are easy thanks to higher seating hip points, too. And in SES trim, a power adjustable driver’s seat and manual front passenger’s seat height adjuster help in this regard. Note, though, that I found it nearly impossible to operate the driver’s seat adjustments with the door closed. There simply isn’t enough room between the seat base and the door panel. The seats are reasonably comfortable, as long as you’re less than 6 feet tall and don’t mind sitting really close to the dashboard. 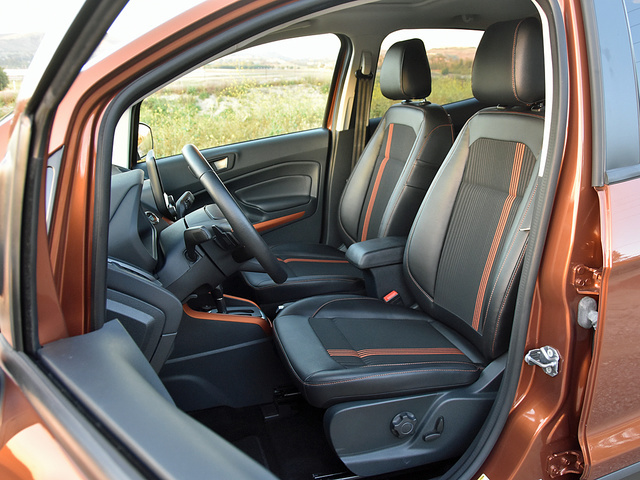 Softly padded door-panel and center-console armrests, combined with a leather-wrapped steering wheel that is enjoyable to grip, make traveling in an EcoSport more bearable. Plus, because the cabin is so narrow, you sit close to your companion, which is good, because on the highway you almost need to yell to be heard above the road and wind noise. The rear seat is more comfortable than it looks. The cushion sits up high with good support, and the front seatbacks are densely padded, Ford evidently knowing that adults will have their knees and shins crammed into it. Foot room is generous, too. Around back, you’ll find a tailgate that swings from right to left. That’s old-school and reflective of the fact that EcoSports in other regions of the world wear a spare tire on the tailgate. In the US market, you get a tire pressure monitoring system and inflator kit. No doubt, the tailgate design is a flaw. It can restrict how you load larger items. And if you’re parallel parked or stuck in stacked parking, and another vehicle is close behind, access is limited. Once you get it open, you’ll find 20.9 cubic feet of cargo space. It’s quite useful, actually, and you can load carry-on suitcases wheels first, just like on an airplane. The load floor is adjustable too, giving you reconfigurability options. 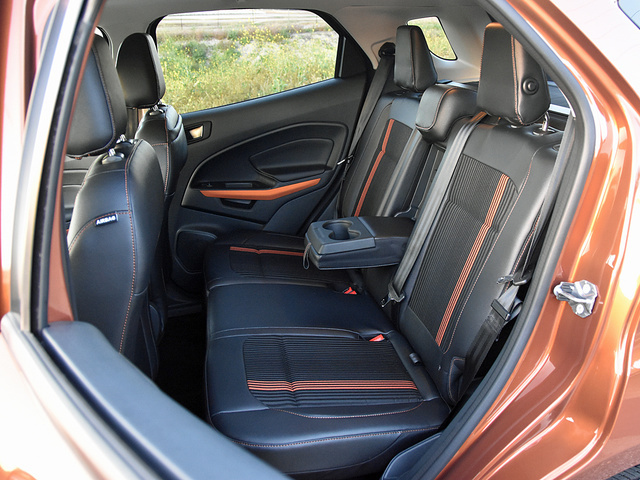 Fold the rear seats to create a maximum of 50 cubic feet of volume. 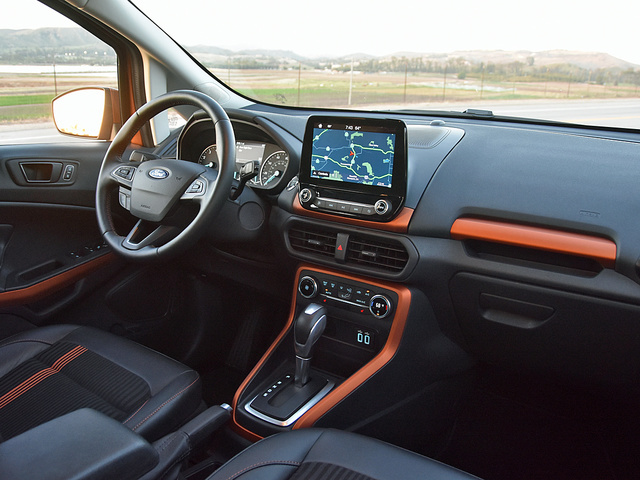 One of my favorite things about the EcoSport, aside from my test vehicle’s Canyon Ridge paint and matching copper-hued interior trim and seat stripes, is the Sync 3 infotainment system. It looks utterly out of place in such a cheap vehicle, but it gives the EcoSport a much-needed boost of modernity. Generally speaking, I like Sync 3, and not just because it’s such a huge improvement over the old MyFord Touch technology the automaker previously used in its products. Pleasing graphics, a simple user experience, smartphone-style screen operation, and reasonably quick response are hallmarks of Sync 3. I’ve also found its voice-recognition system to work well, even if the optional navigation system’s GPS location capability has proven sketchy in recent Fords I’ve reviewed. Here, it is rendered in a freestanding tablet design, complete with Power/Volume and Tuning knobs that look like they would be entirely at home in a Lincoln. 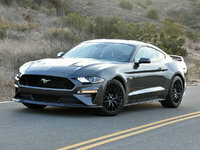 Highlights include Apple CarPlay, Android Auto, Sync Connect services including a 4G LTE Wi-Fi hotspot, and a FordPass suite of mobile apps. With Titanium trim, Sync 3 is paired with a Harman-sourced premium B&O Play sound system, but I thought my test car’s 7-speaker sound system produced decent sound quality. The EcoSport is not offered with forward-collision warning, automatic emergency braking, or lane-keeping assist technologies. You get a reversing camera. You get an emergency brake-assist system that can help shorten stopping distances when necessary, but not prevent a collision. And when you buy the SE, SES, or Titanium version, you get rear parking-assist sensors, a blind-spot monitoring system, and a rear cross-traffic alert system. Additionally, Ford’s MyKey technology is standard on all EcoSports. Using it, you can program various vehicle settings to encourage safer driving by teenagers. Sync 3, included with all trim levels except the base EcoSport S, adds 911 Assist to the SUV. As I write this review, neither the federal government nor the Insurance Institute for Highway Safety (IIHS) has performed crash tests on the EcoSport. It has been subjected to European New Car Assessment Programme (Euro NCAP) testing in Europe, where it earned 4 out of 5 stars, mainly because it lacks modern collision-avoidance technologies. Given the age of the EcoSport’s underlying engineering, and Ford’s rather unimpressive track record of delivering SUVs that fail to earn Top Safety Pick ratings, and how close the driver sits to this vehicle’s steering wheel and dashboard, my advice is to wait until official NHTSA and IIHS ratings are available before buying one. When I was growing up in the suburbs of Detroit, getting a new car was a big deal, even in the Motor City. The shiny paint. The clean interior. The chemical scent to the cabin. The lack of rust on the rocker panels. Friends and family would come over to see it, even if, as was the case once at my house, the vehicle in question was a 1980 Chevy Citation (gag). I understand the allure of a new car. When you’re strapped for cash and the old junker you’ve been driving finally quits for good, and you can actually scrape together the monthly payment for something new, even a Ford EcoSport is appealing. Using Ford’s website, I built the EcoSport SES I reviewed using the configuration tool. Although the sticker price came to $27,875, Ford was offering $3,550 in incentives to apply to a lease. With nothing out of pocket, the monthly payment would have been just over $280 per month. Granted, the lease was restricted to 10,500 miles annually, but trust me, you’re not going to want to drive it that much. Alternatively, you could take advantage of a $500 cash rebate and 0.9% financing for 60 months. Just guestimating here, but that puts the monthly payment at something like $430 per month for an EcoSport SES as long as you pay the sales tax and licensing fees out of pocket. That doesn’t strike me as a bargain, especially in light of the fact that Ford’s warranty coverage, roadside assistance programs, and free trial periods for satellite radio and Wi-Fi aren’t any better than average. If you’re buying an inexpensive vehicle, and stretching to make it fit your budget, you want a Hyundai/Kia-style warranty, roadside assistance, and connected service coverage. 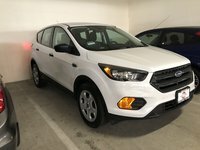 While I absolutely understand the excitement associated with driving a brand-new car home, and I get that you might be loyal to Ford, or live in a small town where dealership choices are limited, or want to “buy American,” in this case you’d be far better served choosing a certified pre-owned vehicle of some kind. Remember, the EcoSport’s existence in the US market is solely to leverage exploding consumer interest in a rapidly growing segment. It is new to Americans, but it is not a new vehicle, and it was not designed and engineered for customer preferences in this region of the world. And that makes it time to redesign the Ford EcoSport, even if it just went on sale in the States. What's your take on the 2018 Ford EcoSport? CDemon They should have put the 2.0L EcoBoost motor in it. This car would be a hoot with 270 HP!! And that barn door rear has got to go, gimme the lift up door! Jeanne The side swinging door is just what people with shoulder problems will love!!! THANK YOU FORD!!! Have you driven a 2018 Ford EcoSport? Enter your zip to see incentives for a new EcoSport in your area. CarGurus has 28,505 nationwide EcoSport listings starting at $13,063.